For my play therapy technique of the mystery counseling session, I created a haunted house. 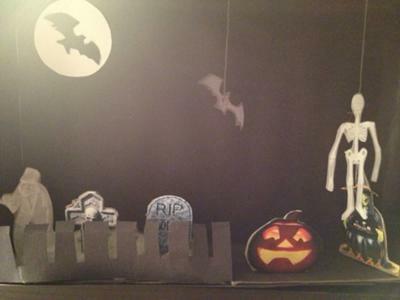 I used a cereal box, black construction paper, cotton, thread and clip art to recreate this haunted house because these are easily obtainable and usually readily available materials. I decided to include some things you would typically find in a haunted house such as skeletons, pumpkins, witches and ghosts. I tried to make it as realistic as possible and once I started constructing the haunted house it took less than an hour to complete. It was ironic that I had to recreate a play therapy haunted house because I was absolutely terrified of haunted houses. Over the years I have declined several invitations to visit Netherworld and other theme park haunted houses out of utter fear. In my quest to overcome the overwhelming sense of fear that has consumed most of my life I visited a haunted house this past Halloween and although scary, it wasn’t as terrifying as I had envisioned. By visiting the play therapy haunted house I was able to face and conquer my fears. More importantly it gave me the courage to face my other fears and live a more liberated existence. The reconstruction of a haunted house can be used in therapy to symbolize the overall fear that clients may experience regarding a myriad of events, places, or things. It can also be constructed to represent the unknown, unchartered territory, the future or themselves. Fear is a very powerful emotion that can have crippling, and debilitating effects if not addressed. I believe that this activity can be very helpful in helping clients deal with their emotions.